According to the Centers for Disease Control and Prevention, tooth decay in children is on the rise. Almost 20 percent of children have untreated caries, and about 41 percent have decay in their primary teeth. Most parents know that good dental hygiene is essential for preventing cavities, but many may not realize how important it is to overall health. 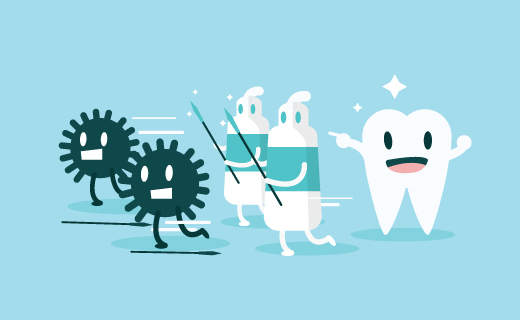 Brushing and flossing help prevent the build-up of bacteria-laden plaque that contributes to the gradual breakdown of tooth enamel, but research has suggested that dental hygiene also has a significant effect on blood vessels. Can Professional Teeth Cleaning Protect Your Heart? American Heart Association researchers recently shared findings demonstrating that good dental hygiene can actually reduce the risk of having a heart attack or stroke. A study that monitored 100,000 people over a seven-year period found that participants who had a professional teeth cleaning once every two years reduced their risk of heart attack by 24 percent and their risk of stroke by 13 percent. Researchers argued that routine dental care and good oral hygiene reduced the growth of harmful bacteria that cause inflammation in blood vessels and periodontal disease. The presence of specific bacteria known to cause gum disease is also associated with a rise in C-reactive protein, a marker for vascular inflammation. Dental care that starts in childhood may help keep your kids healthier for life. When a child’s first tooth erupts at around six or seven months of age, regular brushing and visits to the dentist should soon follow. Additional ways to protect your child from cavities include limiting sticky foods and starchy snacks, avoiding prolonged consumption of sugary drinks, and not letting them fall asleep with a bottle of juice or milk. As your child ages, be sure to make regular appointments with a pediatric dentist and dental hygienist.